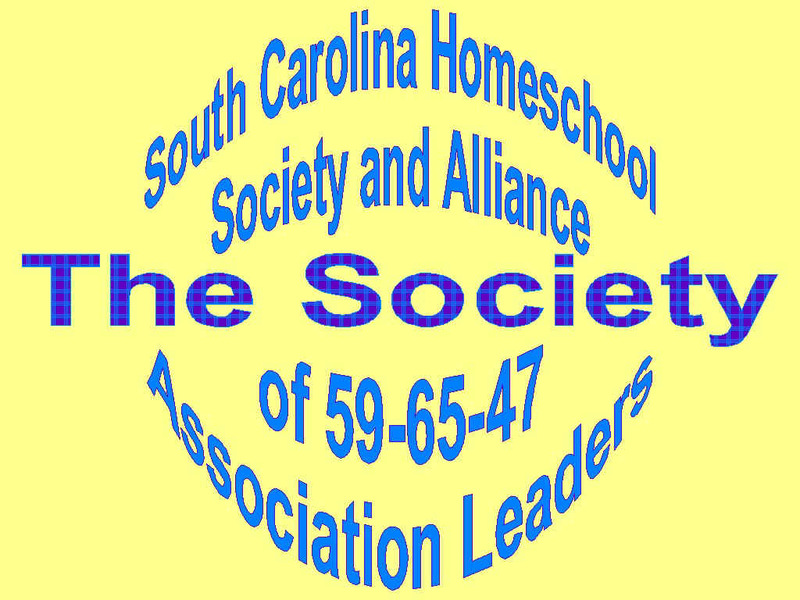 New Beginnings Home School Association is a free, year round (Aug. 01 - July 31), PRIVATE membership, South Carolina home school association. All "New" Member Applicants must be referred by a "Founding Association Board Member!" Fees: There are no membership fee’s. If you are ever contacted by anyone requesting any money to obtain/retain membership, CONTACT THIS ASSOCIATION IMMEDIATELY! If your student is tutored by anyone other than the parent or guardian, you may not apply said work from said tutoring to meet the subjects of the law. (b) the instructional year is at least one hundred eighty days; You have from August 01 to July 31st to obtain 180 days of school attendance. You are not required to teach 4 1/2 hours a day. SC ST SEC 59-65-47 specifically "EXEMPTS" the home school from the further requirements of SC ST SEC 59-65-40 and SC ST SEC 59-65-45. If your student is tutored by anyone other than the parent or guardian, you may not apply said tutoring days to meet the instructional year days. Only the days the parent or guardian taught said student counts. (c) the curriculum includes, but is not limited to, the basic instructional areas of reading, writing, mathematics, science, and social studies, and in grades seven through twelve, composition and literature; and Contrary to what some people are saying, Children in grades seven through twelve are required by law, to be taught reading, writing, composition and literature. You may use your composition and literature to document how this meets the "reading and writing requirements of the law, but you do have to meet the "reading and writing requirement of the law. Note: SC ST SEC 58-65-47 specifically states the words, " and in grades seven through twelve". It does not say, "In lieu of reading and writing." (d) The Parent is required to maintain all records, not the association. (d-2) Key word "SAMPLES". Not every piece of work. (d-3) "Semiannual" is on or near after your 90th day of your school year. Note: Singular word "a" and "report " It does not say, "reports" - plural. Home schools are not required to give grades. Many home schools believe that grades can lead to self esteem issues. We are more concerned with what the child is learning and knows than a letter grade. A simple document, which states the progress in each subject with the mid year attendance record is suffice. In lieu of the requirements of SC ST Section 59-65-40 or SC ST Section 59-65-45, parents or guardians may teach their children at home if the instruction is conducted under the auspices of an association for home schools which has no fewer than fifty members and meets the requirements of this section. Bona fide membership and continuing compliance with the academic standards of the associations exempts the home school from the further requirements of Section 59-65-40 or Section 59-65-45. The home instruction law does not authorize on-site visits to a home prior to approval of a home instruction program, nor does it authorize subsequent visits to determine whether standards are being met; prior visits would only be permissible with the agreement of the parent or guardian as an alternative to providing additional information about the place of instruction. 1989 Op Atty. Gen, No 89-22, p. 60. Use of a correspondence courses does not, alone, constitute a school under compulsory school attendance laws. 1984 Op Atty. Gen, No 84-12. p. 42. All home schools can, are and will be held to SC compulsory school attendance laws. Since correspondence schools issue the diploma, not the parent or association, as allowed by SC ST SEC 59-65-47and can not meet the requirements of SC compulsory school attendance laws, NBHSA will not defend or support any home school, which uses correspondence courses. See: Op Atty. Gen, No 84-12. p. 42. above. NBHSA categorizes "correspondence" schools to fall under "private" school law. New Beginnings Home School Association of SC members are "not allowed" to take any tax credit or tax deduction, ever, which can be or is, educational in any form. This applies to any State tax; and Federal tax, which may be allowable by law. Should any New Beginnings Home School Association of SC member take any form of any said tax credit or tax deduction, at any time, membership with New Beginnings Home School Association of SC is terminated at the very moment, second, and time, said member violates any part of this section, without any prior notice!